Brother has launched the world's first wireless label printers, that connect and print labels from almost any handheld device from mobile phones to tablets. 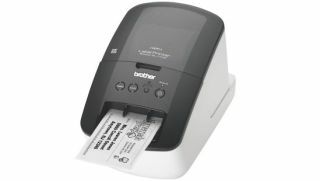 The Brother WiFi-enabled label printers – the QL-710W and the QL-720NW - can output almost 100 labels a minute, are powered and controlled using Brother's iPrint and Label app for Android and iOS mobile operating systems and take the output from Microsoft Office programmes - including Word, Excel and Outlook. The new printers also include a range of pre-designed, professional looking labels, which can be used to create visitor badges, and labels for CDs, QR codes and barcodes. The QL-720NW can also be connected to a network, so all workers in an office can use the device, without the need to install software. Brother claim the printers are less expensive to run than competitor machines; quoting a 25% reduction in the cost of each printed label. The machines and app are available from July and are priced from £149. For more information, visit www.brother.co.uk/labelling.